I'm actually not a fall girl... (I love summer!) but this color combination was tons of fun for me. Surprising, because it brought me out of my comfort zone a bit with all that Cajun Craze. But you know how much I love Early Espresso, which helped to tone things down! 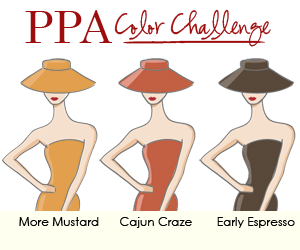 I started out with a piece of Early Espresso, which I matted with some More Mustard and placed on my Cajun Craze card. Then I embellished away with some strips of Comfort Cafe and Early Espresso DSPs, a Perfectly Preserved jar filled with pears and topped with some Howlstooth and Scarringbone DSP and some Linen Thread, and a Brushed Bronze Designer Button to finish things. I hope you'll join us this week over at Pals Paper Arts. Remember, you can use any brand of crafting goodies to play along! love the strips of dsp. beautiful CAS. I love how you used the challenge colors, Nina. So cute! You did a fabulous job pulling these colors together! I really like the use of the DSP and button to highlight the jar. What a great fall card, Nina! I LOVE those pears!!! Just perfect Nina! I love that layout, you did a fabulous job. Hi, Nina! I love your card! My favorite part are those "ribbon" banners. Naki and Nina's Double Dare Challenge 10!